Holi is considered as one of the most celebrated festivals of India and it is celebrated in almost every part of the country. It is also sometimes called as the “festival of love” as on this day people get to unite together forgetting all resentments and all types of bad feeling towards each other. I prefer to play holi but only with water, no color. So my daughter asked me to gift her holi water bag pichkari (water gun) on this holi. I promised her to bring it, but I really had tough time as she wanted only pink color in it and no other color. Thank fully in one shop, I got a pink color mini mouse water bag with a red color gun. However, she refused to take that as she only wanted pink. She said “Pink is only my favourite color”. I don’t know why she is so obsessed with pink. So while I was moving in search of the pink color holi water bag pichkari (water gun), this sign board came in front of me as if someone wants to tell me, please don’t get annoyed and “think pink”. No words, what you think you See. So we moved to another shop again with these colorful bags. Check this out. After half an hour of convincing her finally, she agreed for a frozen blue color bag. Thank god!! You guys enjoy Holi, Festival of Colors. 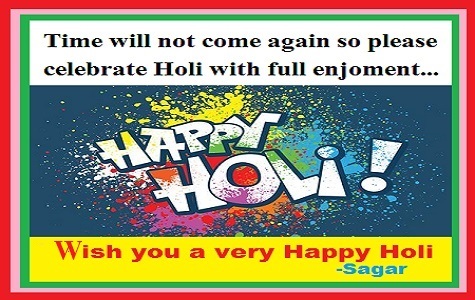 Take care and Happy Holi. All your articles are very good and for this I can say one big Congratulations .All the best for you and your familly.I like the positive and happy people like your. Think Pink, but Blue will do.. 😅 , Happy Holi!!!! Yep I did..😆 Pink is naturally the first choice of all lil girls, as far as I have seen. Happy Holi! I once participated in the color festival with my Indian roommates in the court yard. I see what you mean! 😉 Otherwise it was a fun celebration! Yes and I like pink more. Oh, this was a cute post. Such a cute post!!! Happy Holi! Think Pink 🙂 Loved it. two is better than one, your parents must have had it easy 🙂 I still dont have a favorite color. Happy Holi! Thanks for sharing! I love learning new and positive celebrations from around the world. wonderful colours and i love that she loves pink, we girls who love pink rock! !